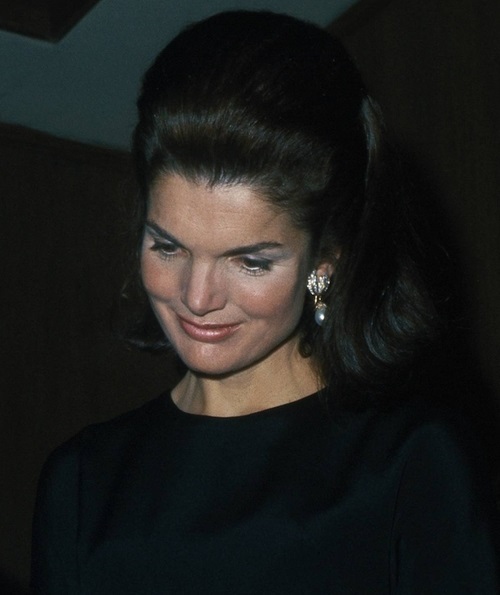 In honor of the birthday of Jacqueline Bouvier Kennedy Onassis (born: July 28, 1929 died: May 19, 1994) this post will discuss several items from her personal jewelry collection that she received from her husband, President John F. Kennedy. Jackie gained the world’s attention as First Lady and she famously oversaw the renovation and restoration of the White House but she was also known as a fashion icon with women in the 1960s emulating everything from the clothing she wore to the way she styled her hair. 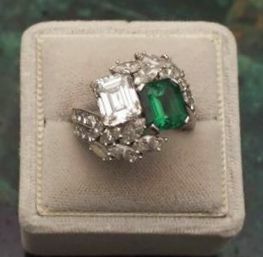 Jackie’s engagement ring was a lovely 2.88 emerald and baguette diamond ring, in 1962 she had the ring redesigned to include not only the emerald and diamonds but it was also set with an additional 2.88 square-cut diamond and marquise diamonds, as shown in the photo below. The night before their wedding, JFK presented Jackie with a lovely diamond bracelet which she wore as her “something new”. The bracelet features 25 diamonds and 18 pearls with two borders on either side of thin and rather whimsical nautical ropes. Jackie wore the bracelet on her wedding day along with a pearl choker necklace and a diamond leaf brooch that she received as a gift from Joseph and Rose Kennedy, her new in-laws. Special Note: Jackie’s wedding bracelet was donated after her death to the John F. Kennedy Presidential Library and Museum. For their first year wedding anniversary in 1954, JFK gave Jackie a set of pearl and diamond earrings. The earrings are interchangeable and can be worn in a variety of different ways. The diamond pave-set leaves can be worn alone or with either the white pearl drop or black pearl drop sets which both have diamond pave-set flower petal caps. 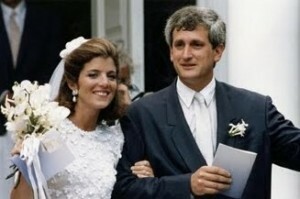 The photo on the left shows Jackie wearing the earrings and the photo on the right shows Caroline wearing her mother’s earrings as her “something borrowed” on her wedding day in 1986. JFK had a custom of marking special occasions with extravagant gifts and shortly after the birth of their son John Kennedy, Jr. in 1960 JFK gave Jackie a lovely Schlumberger Berry Brooch. What makes the gift more thoughtful was the fact that he purchased the brooch from the Tiffany store in New York while he was in the midst of organizing his presidential administration in the busy months before his inauguration. 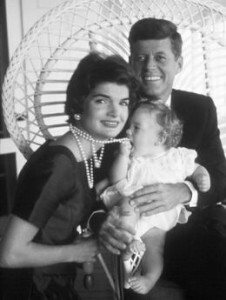 The brooch was given to Jackie in January 1961 just a few days before JFK was sworn in as President of the United States. The brooch was meant to represent the couple’s two children and Jackie absolutely loved it! The Schlumberger Berry Brooch is set in gold and features rubies and diamonds. At the time it was one of the few jewelry pieces that Schlumberger made for Tiffany, the exclusive jewelry store located on Fifth Avenue. After Jackie’s death, Caroline inherited the brooch and it is currently on loan to the JFK Presidential Library and Museum in Boston where it can be seen proudly displayed with other Kennedy memorabilia. 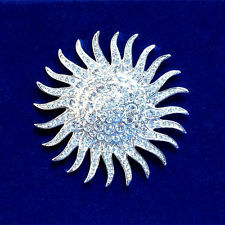 While in London in 1962, Jackie found a spectacular sunburst pin in an antique store and she knew she had to have it! 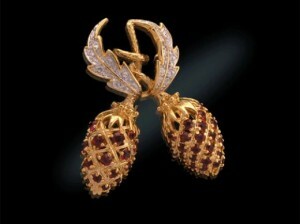 The problem was the brooch had a $50,000 price tag, so to purchase the expensive sunburst brooch Jackie quietly sold the diamond leaf brooches that were a wedding present from Joe and Rose Kennedy; she had copies made so as not to offend her in-laws. The antique starburst diamond brooch was originally made in the nineteenth century and is set in silver and gold, it was purchased from the British Crown jeweler Wartski. Jackie wore it often attached to one of her magnificent Oleg Cassini gowns for various White House functions but once she wore it in a very unusual way by having her longtime hair stylist, Kenneth, attach the brooch into an elegant chignon hairstyle which he attached to the top of her head as shown in the photo below. 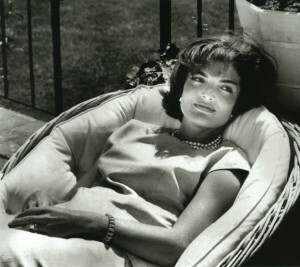 JFK purchased one of Jackie’s first Schlumberger croisillons bracelets in 1962 from Tiffany in New York City. 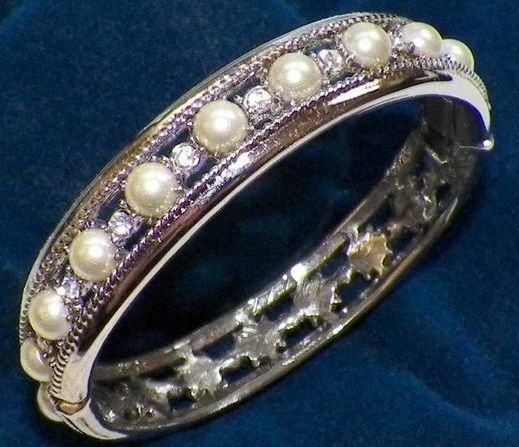 Jackie loved the bracelet and would frequently wear it with her casual daytime outfits; she eventually bought others to add to her collection in a variety of different colors. In the early 1960s, Jean Schlumberger began making the croisillon bracelets using a paillonné enamel technique first used in the 19th century. 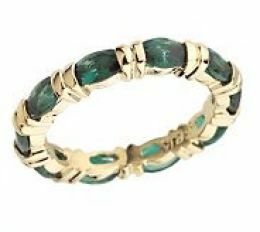 A classic Schlumberger bracelet uses a process of layering enamel over a gold bracelet and, like many women trying to emulate the style of the First Lady, the bracelets worn by Jackie made them very popular and created a new trend. In 1963 JFK gave Jackie a classic Cartier tank watch and on the back he had engraved, “To Jackie, Love Jack”. 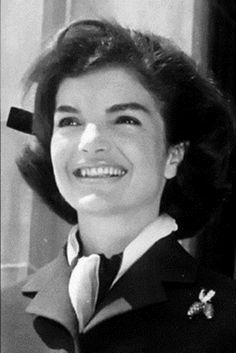 Jackie frequently wore the watch during casual activities such as horseback riding at Glen Ora, the 400 acre property they were leasing in Virginia, or sailing at Hyannis Port with other members of the Kennedy family or simply spending the day shopping in New York City. For their tenth year wedding anniversary in 1963, JFK gave Jackie a special emerald ring. JFK commissioned Van Dleef & Arpels in New York and was designed as an “eternity ring” with ten emeralds representing each year of their marriage; she wore the ring next to her wedding band. Several years after the death of JFK Jackie had two of the emeralds removed to make two solitaire rings for her children. One was made for Caroline and the other for John Jr. who gave it to his bride, Carolyn Bessette, on the night before their wedding. After the death of her brother, the ring was given back and now Caroline Schlossberg owns all three rings. Sadly one of the most significant gifts given to Jackie from JFK was given to her after his death. In August 1963, the couple had lost their newborn son, Patrick and seemed to be an experience that brought JFK and Jackie closer together in their shared grief and they were very optimistic for their future. 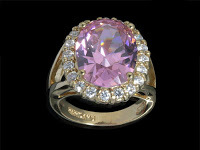 A few months later, JFK was in New York City and he went to Van Cleef & Arpels to order a special ring which featured a large 47 carat kunzite surrounded by 20 diamonds which he intended to give to Jackie for Christmas that year. Sadly, before that could happen, President Kennedy was assassinated in Dallas on November 22, 1963. In the days after the President’s death, the ring was delivered to the White House and Mrs. Lincoln, JFK’s personal secretary, gave the ring to Jackie. The ring, a final posthumous present for her beloved husband, came to hold special sentimental meaning for Jackie. 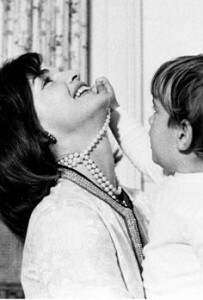 Jackie Kennedy’s multi-strand faux-pearl necklaces became one of her most frequently worn jewelry item. She owned several necklaces in a variety of different lengths ranging from the single-strand pearl choker necklace she wore on her wedding day in 1953 to her most often worn triple-strand pearl necklace 17 inches in length, she also had one 19 inches in length. Shown below are two charming photos of Jackie’s children tugging at her pearl necklace, Caroline on the left and John Jr. on the right. This entry was posted in Miscellaneous and tagged Barbara Jones, Enchanted Manor, Jackie Kennedy, Jackie Kennedy Anniversary Earrings, Jackie Kennedy Cartier Tank Watch, Jackie Kennedy Engagement Ring, Jackie Kennedy First Anniversary Pearl and Diamond Earrings, Jackie Kennedy Kunzite RIng, Jackie Kennedy Multi-strand Faux-Pearl Necklace, Jackie Kennedy Personal Jewelry Collection, Jackie Kennedy Schlumberger Berry Brooch, Jackie Kennedy Schlumberger Croisillons Bracelets, Jackie Kennedy Tenth Anniversary Emerald Ring, Jackie Kennedy Van Cleef & Arpels Emerald Ring, Jackie Kennedy Vintage Sunburst Diamond Brooch, Jackie Kennedy Wedding Bracelet, John Kennedy last gift to Jackie, Miscellaneous post, The Enchanted Manor, the personal jewelry collection of Jackie Kennedy by barbara. Bookmark the permalink. Hello, I am so interested in all things Kennedy.. and Jackie in particular. I have some of the replica jewelry pieces and I am always looking for information about the real ones. 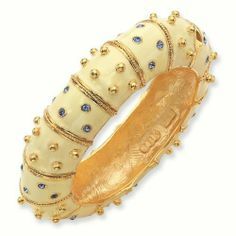 I was wondering about the information you have regarding the Schlumberger enamel bangles… I had read somewhere else that her friend Bunny Mellon had given them to her. 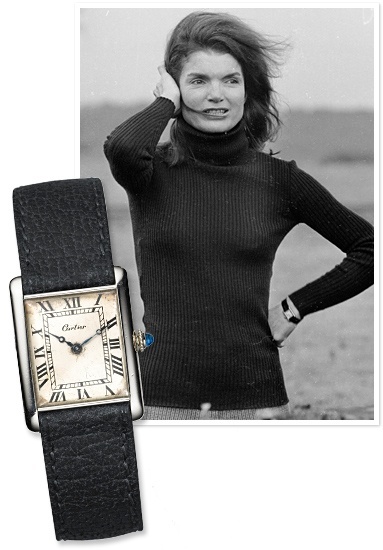 And about the Cartier tank watch… that she had it made after JFK died and she needed a black watch as she wasn’t wearing jewelry for a year after. And supposedly it had small diamonds up the sides? I have seen the replica made by Camden and Kross. I was wondering which information is correct? Perhaps your sources know more than others? I thought I would write here and check to see what you thought about that. I am new to your blog but love the information and photos that go along with. I was also raised in the 1950s with a stay at home mom and dad that worked. Thanks and would be wonderful to hear more from you. Thank you Karen and I’m glad you visited my blog. 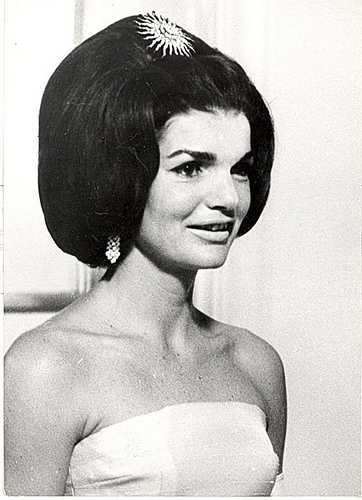 My information about the Jackie Kennedy’s jewelry collection is rather limited so I would suggest searching the internet for the answers to your questions.